Our heroes continue to cross the desert when their old acquaintance Cudley the Cowlick (issue #7) arrives and informs them that Mr. Stump, head of the Intergalactic Wrestling Federation, wants them to appear on his show again. The Turtles are so tired of walking the desert that they agree to have Cudley take them across the galaxy to Stump’s asteroid to see what he has to offer. Master Splinter isn’t happy that they’ve cut their tour of the world short. 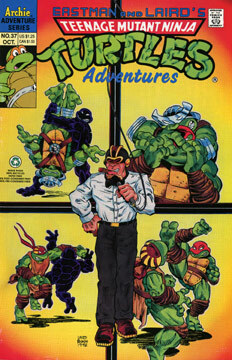 The TMNT head to the locker room to don their wrestling costumes, where they meet Cryin’ Houn’, Ace Duck (issue #7) and Trap (from issues #12 and #13). Trap informs the mutant dudes that Stump has decided that this time, since it’s a tournament, they’ll have to wrestle each other! The winner of the tournament will then have to take on El Mysterio for the title. As Ace Duck begins the tournament against a werewolf named Bloodbath, Master Splinter and Ninjara discuss her relationship with Raphael. The Sensei admits that while he intitially didn’t trust her due to her partnership with Chien Khan (issue #29), he has come to trust her completely – but it is difficult for him to accept her relationship with Raph, as it means that his sons are growing up. Ninjara hugs Splinter as they view the beauty of outer space through a gigantic window. At this point, the main event begins – the TMNT in a free-for-all against one another. After a long bout, Donatello finally manages to pin Raphael and win the match. El Mysterio (Cryin’ Houn’ in a costume) arrives in the ring, but Don is too quick for the lumbering four-armed wrestler and quickly pins him as well. Donatello is declared the winner and receives a kiss from the ring girl. Soon, Cudley is flying through space, carrying our heroes home.